“Fiorello” was the 1959 Tony Award-winning hit that had made Jerry Bock and Sheldon Harnick a famous Broadway duo. Their next project: turning Sholem Aleichem’s Tevye Stories into a musical that “just happened to be Jewish.”1 Bock and Harnick had personally, for the most part, left Jewish religious observance and Yiddish behind. However, they still wanted to engage with Aleichem’s themes and historical implications with their next project. 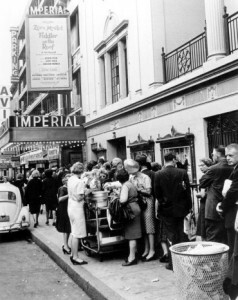 2In 1964, Fiddler on the Roof made its Broadway debut at the Imperial Theater, encompassing perceptions before and after WWII of Jewish identity, as well as bringing “Jewishness” into popular American culture. 5Robbins drew from shtetl histories and hosted screenings of “Laughter through Tears,” a film that depicts Jewish life in pre-revolutionary Soviet Russia for the show’s costume and set designers in hopes that they would draw ideas for the show from it. Robbins also crashed Jewish weddings with cast members in hasidic dress in Brooklyn’s Borough Park to observe the “schnapps-fuelled dancing.” He even attempted to bring Othodox social customs to the rehearsal hall by enforcing gender segregation, but his attempt only lasted a few hours before the actors rebelled! 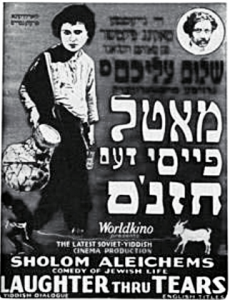 The song was inspired by the 1902 monologue by Sholem Aleichem in Yiddish, Ven ikh bin a Rothschild (If I were a Rothschild), a reference to the wealth of the Rothschild family. The lyrics are based on passages of Aleichem’s “The Bubble Bursts,” one of his short stories. In the first two verses, Tevye dreams of the material comfort wealth would bring to him. I see this as Tevye’s character being drawn to “mainstream American culture” that values consumerism and capitalism, especially in postwar society. In the final verse, Tevye further considers his devotion to God, expressing his sorrow that his long working hours are preventing him from spending more time in the synagogue praying and studying the Torah. I see this as Tevye’s character further being drawn back by his Jewish roots and culture and away from the temptation of materialism. Finally he ends by asking God if “it would spoil a vast eternal plan” if he were wealthy. I believe this is Tevye summarizing his internal identity conflict with asking God how he can balance mainstream culture with his strong faith. 1 Solomon, Alisa. Wonder of Wonders: A Cultural History of Fiddler on the Roof. New York: Picador, 2014. Recreating Jewish Identity in the postwar era: Is Fiddler on the Roof Jewish enough? The story focuses on Tevye and his attempts to maintain his Jewish religious and cultural traditions, while outside influences encroach upon his family’s lives. He is forced to cope with the strong-willed actions of his three older daughters, who marry for love instead of following the matchmaker, Yente’s choice. Each daughter’s husband moves further away from the customs of Tevye’s faith and the edict the Tsar has made that evicts Jews from their village. I find this storyline to be perfect for a postwar hit in line with the recreating of Jewish identity. Jews in America are no longer concerned with security and genocide, and therefore must come to terms with their faith–often questioning God, their faith, Jewish law as is seen in Tevye’s character. 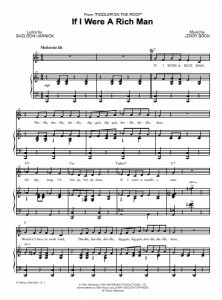 I think this is clearly seen by the opening song, Tradition, which explains the traditional roles and social classes in Anatevka and the villagers trying to continue their traditions and keep their society running as the world around them changes. This echoes the real-life struggle to reshape Jewish identity in the postwar era in America. There seems to be quite a debate between Fiddler being too Jewish by creating a story centering around Jews so soon after World War II. But also and I think more so, that Fiddler isn’t Jewish enough because Jews (like the investors) wanted to tame the Jewishness of the show in order to appeal to a wide audience. Ultimately, the goal any Broadway is to sell tickets and fill seats. 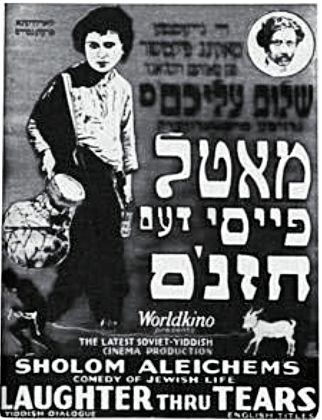 Perhaps though in the process of selling seats and appeasing a wide audience, much of Sholem Aleichem’s original story may have been misinterpreted and/or misrepresented. 4 Stang, Joanne. “At Home With Tevye.” New York Times (1923-Current File), Oct 04, 1964. http://search.proquest.com/docview/115569663?accountid=351.